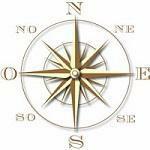 Provinces we will be visiting : Crotone - Vibo and Cosenza. 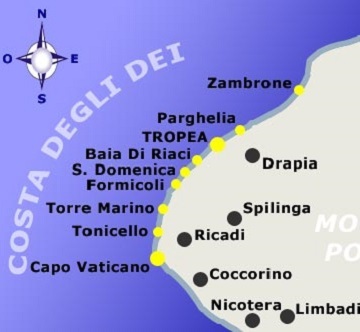 Sesto giorno - 6th day - We start the tour by visiting Stilo, still in the province of Reggio, and then we will be traveling to the provinces of Vibo Valentia, Crotone and Cosenza. 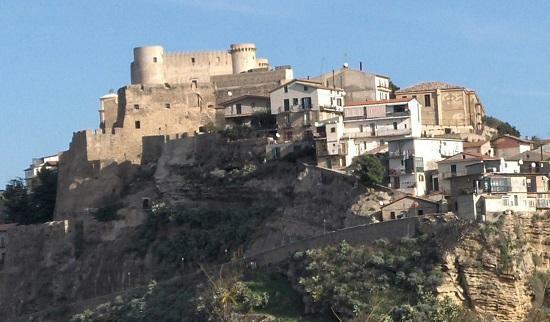 Stilo is one of Calabria's most important medieval centres. 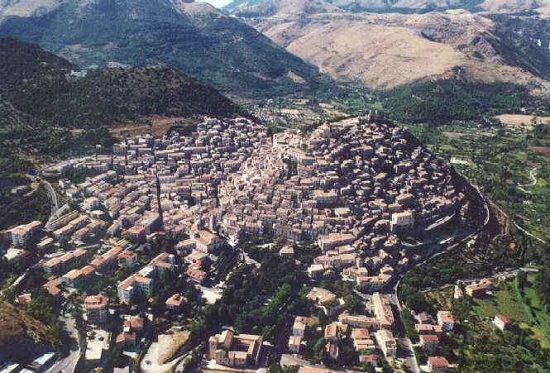 The old city is located on the slopes of Mount Consolino. Of Byzantine origins, the town historical centre is enhanced by the Catholic, a well preserved church dating back to the 7th century and displaying a type of structure very popular in Armenia, Peloponnesia, Anatolia and Georgia. 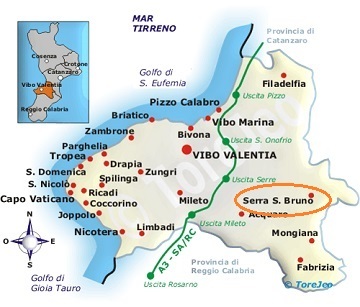 We will then proceed toward Serra San Bruno, in the province of Vibo Valentia. 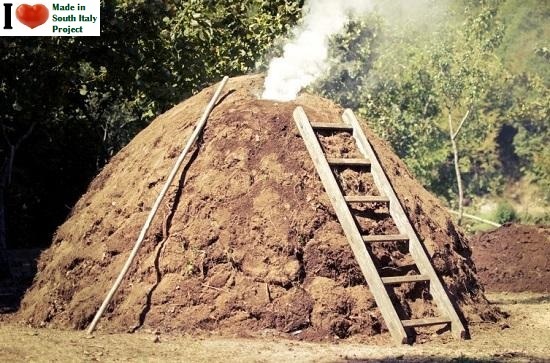 "A Carvunara" a "miniature vulcano" look alike, skillfully built by local loggers to make charcoal (the wood must be cut and stacked in a certain way and then covered with leafs and soil to keep oxygen out and to allow for a 'slow baking' of the wood, finally a fire is lit and let it cook for several days). It is very hard work, passed on from generation to generation. Lunch will be served at a local farmhouse (Agriturismo) and will be based on local specialties...don't worry...it will be tasty and plentiful. Afternoon : Guided tour of the Certosa Museum, which reproduces the environments of the Carthusians and illustrates their mystical life and working within the Certosa. Accommodation in a three star hotel in Serra San Bruno, dinner and overnight stay. Giorno 7 - Seventh day -Among the coastal areas of Calabria, the Coast of the Gods (Costa degli Dei) also known as Costa Bella (The Beautiful Coast) is certainly the most famous and popular, with places such as Tropea and Capo Vaticano. Following breakfast we will transfer to Tropea for a guided tour of the city. 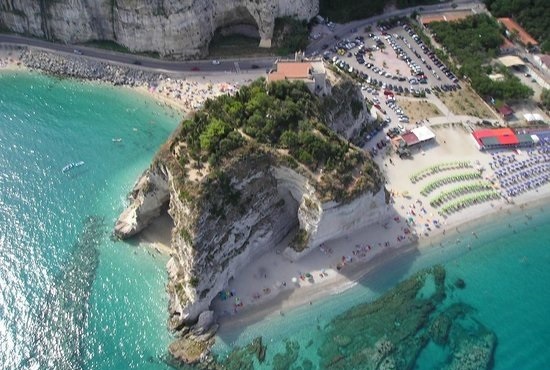 Tropea is one of the major tourist attractions of Calabria, with its historic center and typical narrow streets, old sudden squares crowned by noble palaces many of whom are now being renovated. 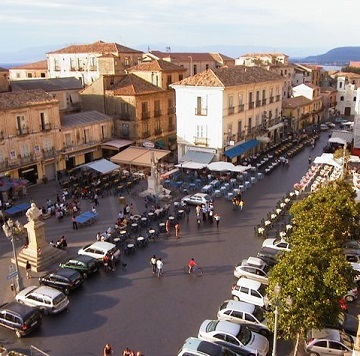 Transfer to the nearby city of Pizzo Calabro for a stroll in Piazza della Repubblica, the, "living room" of the city to sample the famous Tartufo ("Truffle ice cream") and visit the the Castle (External) and the church of Piedigrotta excavated entirely in the tuff and decorated inside by statues, also of tuff, depicting religious characters. Below is Pizzo Marina. 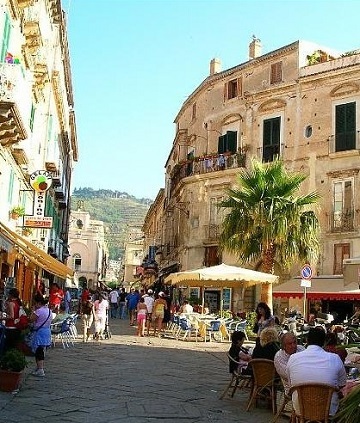 Transfer to Cosenza , dinner and overnight stay in a four star hotel. Ottavo giorno - 8th day- Guided tour to the Sanctuary of San Francesco di Paola, followed by a guided tour of old Cosenza - Supper and overnight stay. 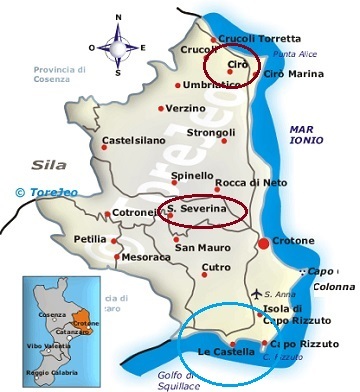 We are now driving north-east toward the province of Crotone, destination Santa Severina, the Castella and the wine making area of Ciro'. (See image on the right). Santa Severina is a picturesque town of ancient origins, built on a sheer cliff with a lovely view and charming narrow streets. 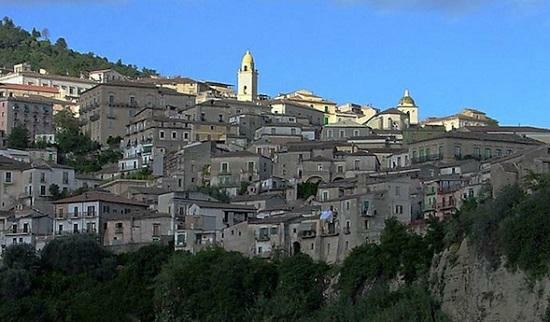 The town is dominated by the imposing castle and the church of Santa Filomena with its chapels. Following lunch at a local restaurant we will continue the tour with a visit to the Ippolito Winery in the Ciro' area where we will learn a bit about the different methods of wine making and of course, a taste of the precious liquid. 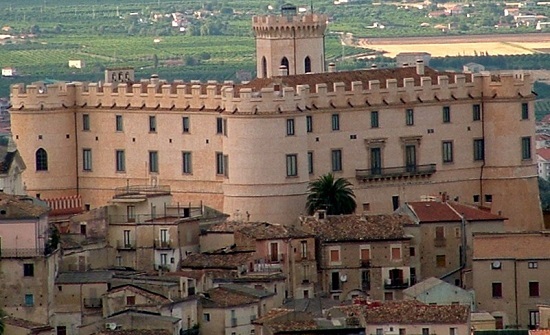 From the winery we will transfer to Corigliano Calabro, in the province of Cosenza, for a visit to yet another castle. One of Calabria's most preserved, reconstructed in the 15th century and restored in the 19th . Our tour for the day will end at Rossano Calabro where we will have supper and spend the night. Giorno nove - 9th day - Breakfast. 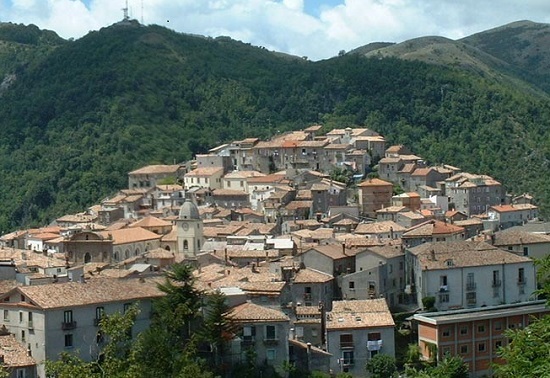 Guided tour of Rossano, an ancient, picturesque and lively town also refered to as "the Ravenna of the South ". considered one of Calabria's main religious Byzantine center with seven Basilian monasteries. It does not take long to realize that even a simple stroll through the narrow streets of the city can be transformed into an amazing journey full of stops before extraordinary examples of the artistic heritage of Rossano Calabro. The tour continues with a visit to a old factory know worldwide for its Licorice, the Amarelli , where we will tour the museum. The company has officially made licorice for 250 years, but family records go back to the early 1500s, making them one of the oldest family-run firms in the world. 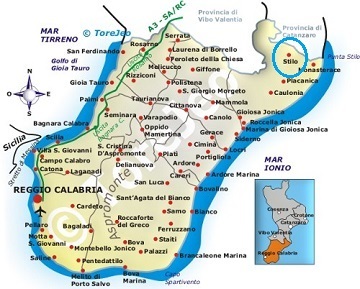 Lunch will take place at the hotel following which, we will transfer to Morano Calabro, another town officially listed as one of Italy's most beautiful. Transfer to the hotel - dinner and overnight stay. 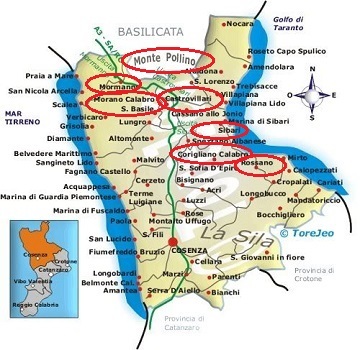 Decimo giorno - 10th day - Following "breaky",we will be heading in the Pollino Mountains, to the grotto of the Romito discovered in 1961 (The area is close to the border with the Basilicata region). The discovery has shed a light on events in prehistoric northern Calabria, and showed that it was inhabited at least 20,000 years ago. There will be a brief visit to the medieval town of Mormanno before heading back to the hotel for lunch. 11th day - Undicesimo giorno - Among the Arbereshe and Byzantines. Breakfast. 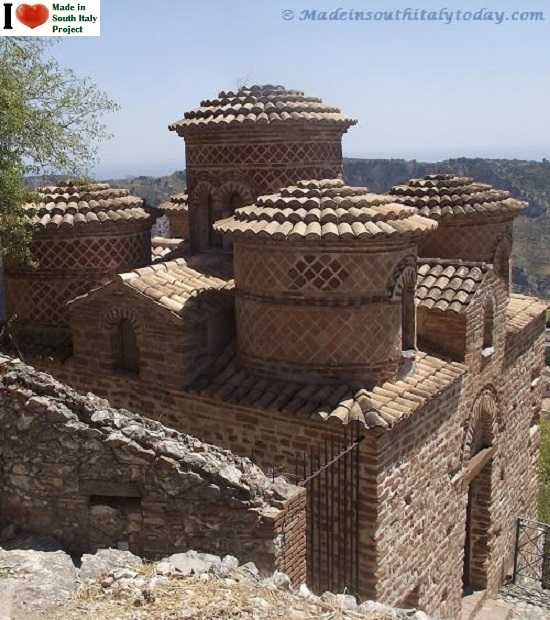 Transfer to the famous Byzantine Sanctuary of the Madonna delle Armi, perched on the side of the mountain.The Sanctuary, located at an altitude of 1000 meters, is among the most valuable monumental complexes, of medieval origin, in Calabria. From here you can admire the breathtaking view of the Sibari Plan and the north-eastern side of the Pollino in the territory of Basilicata. 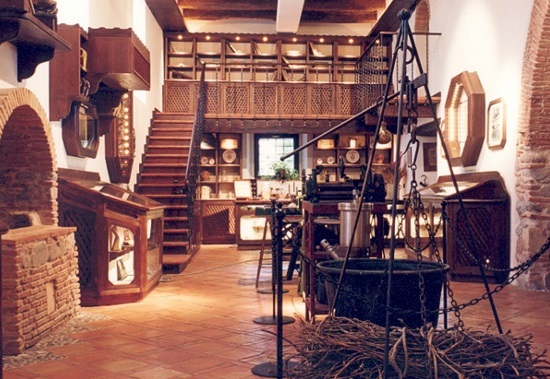 We will then proceed to the Museum of Bread located in the town of Cerchiara di Calabria where the local bread is known of maintaining his goodness and fragrance for several days. 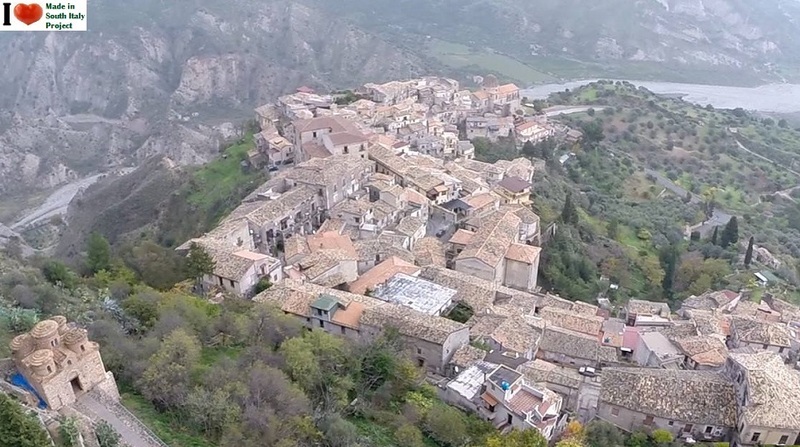 We continue the tour with a visit to the arberesh village of Civita, where the local people still keep alive the language and customs of ancient Albanian origin. Once in town we will have the possibility to taste some of the local products, meats, sauces, cheese and wine. 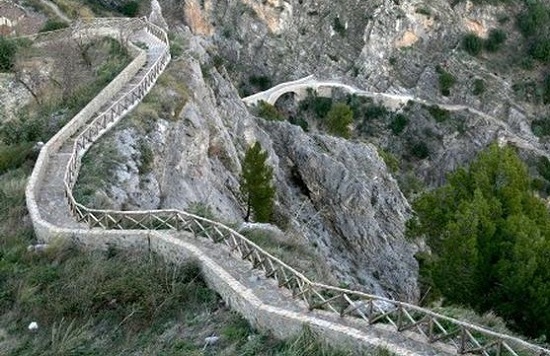 Soon after we will be driving to the so called Devil's bridge, ancient Roman bridge over the gorge of Raganello, later on we will take a short walk around Civita to learn more about its Byzantine rite and its odd looking chimneys. Lunch will take place in a typical restaurant. 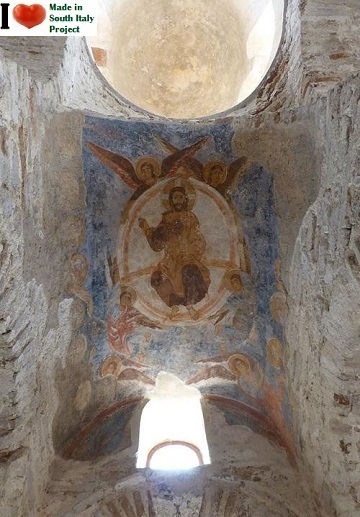 surrounding the Italian-Albanian culture,, including a visit to a workshop of sacred art Byzantine where you can admire the beautiful works created and learn about the various stages of processing being carried out with ancient methods. 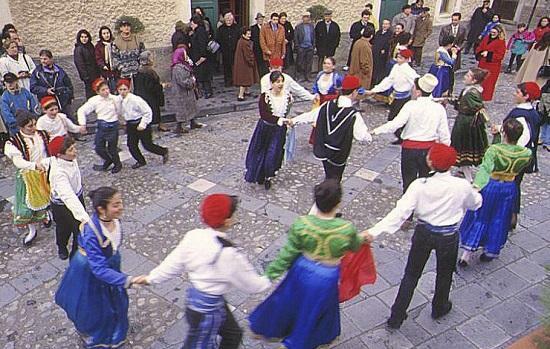 We will be participating in a street dancing show with local dancers wearing their traditional dress. 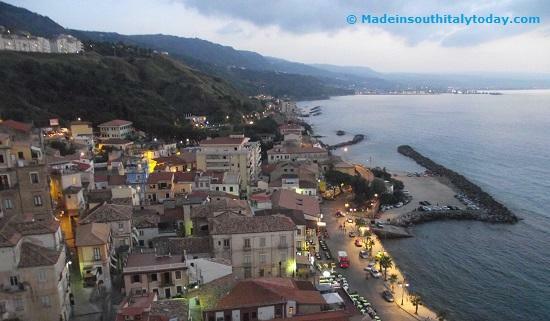 After breakfast say "arrivederci" to your fellow travelers and to Calabria. Serra San Bruno is locate in the province of Vibo Valentia, about 40 km southwest of Catanzaro and about 25 km southeast of Vibo Valentia. 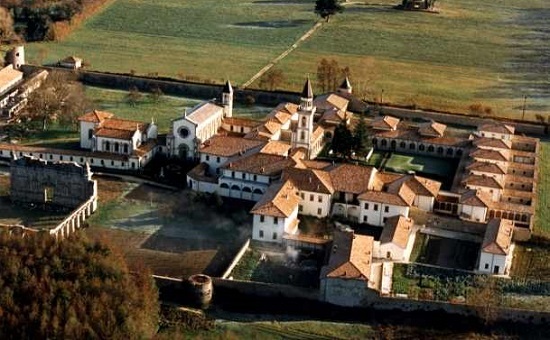 Close by is the famous Carthusian monastery, Serra San Bruno Charterhouse (Certosa di Santo Stefano di Serra San Bruno), around which the town grew up. 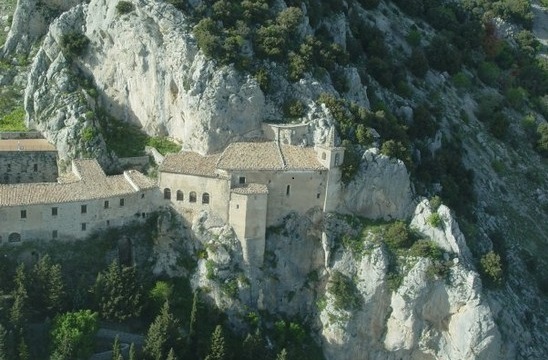 The town is named after Saint Bruno of Cologne, who founded the Carthusian Order in 1053 and the Grande Chartreuse, mother house of the Carthusians, near Grenoble, in France. He built the charterhouse of Serra San Bruno in 1095, and died here in 1101. Costa degli Dei (Coast of the gods) or also known as Costa Bella (The beautiful Coast) in the province of Vibo Valentia. Tropea is a picturesque town on the Tyrrhenian coast, located between the Gulf of San' Eufemia and the port of Gioia Tauro. There is a fishing port and some agriculture and artisan activity. The town largely dates from the 16th and 17th centuries but its roots go back almost 3000 years. A few kilometers south of the existing port there are traces of Portus Herculis mentioned by Gaius Plinius Secundus (AD 23 – August 25, AD 79, better known as Pliny the Elder, a Roman author, naturalist, and natural philosopher, as well as naval and army commander of the early Roman Empire). On to the province of Crotone . 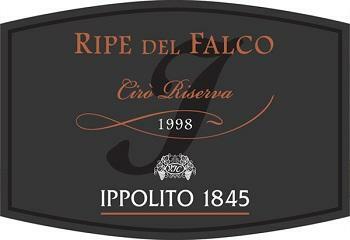 Founded in 1845, the Ippolito can boast the title of oldest existing winery in Calabria today. Rolling Vineyards and sunny extending for over 100 acres. The Ippolito winemaking traditions accumulates well over 160 years of work experience and satisfaction along with a fervent desire to create, surprise and amaze wine lovers all over the world. On to the Cosenza province . 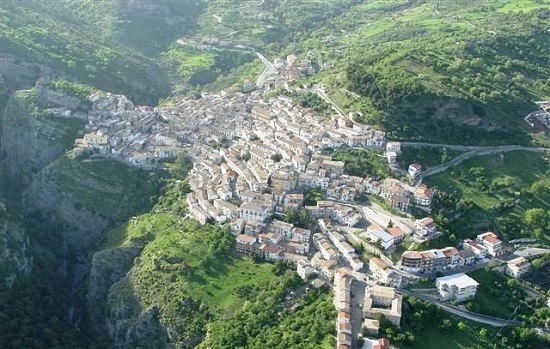 Corigliano is an agricoltural, commercial and tourist resort in the northern pre-Silan hills in the Sibari Plan. Roscianum was the original name of the town under the Roman Empire. 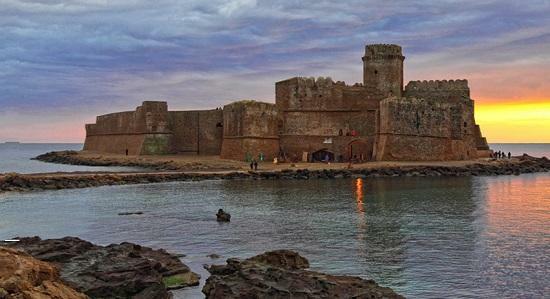 In the 2nd century AD, emperor Hadrian built a port here, which could accommodate up to 300 ships. It was mentioned in the Antonine itineraries, as one of the important fortresses of Calabria. The Goths of Alaric I and, in the following century, Totila, were unable to take it. Its Greek character was preserved long after its conquest by the Normans, as noted by its long retention of the Greek Rite over the Latin Rite. 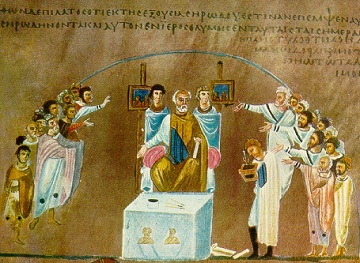 The incomplete Codex purpureus Rossanensis containing the Gospel of Matthew and Gospel of Mark is also preserved in the cathedral. The Rossano Gospels, a 6th Century illuminated manuscript of great historical and artistic value, is a tangible relic of that period. Rossano was the birthplace of Pope John VII and Antipope John XVI as well as the birthplace of Saint Bartholomew the Younger and Saint Nilus the Younger, who founded the Abbey of Grottaferrata, and whose "Life" is a valuable source of information about southern Italy in the Tenth Century. Near the border with Basilicata and hard to miss from the motorway. 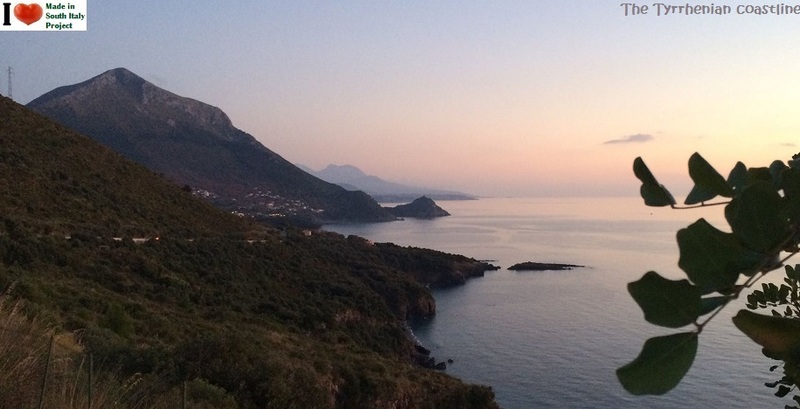 The town offers a breathtaking panoramic view on the wide valley of the river Coscile (the ancient Sybaris), once a strategic outpost, cultural and commercial crossroads of the Magna Graecia . 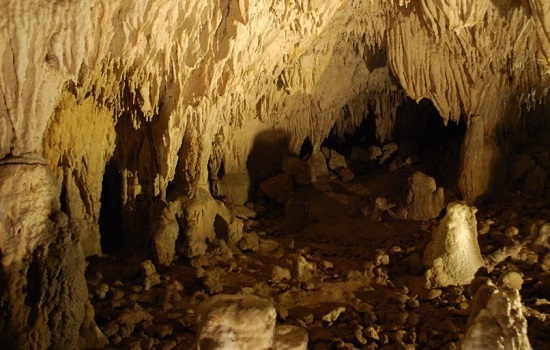 Papasidero and the Romito cave. Unfortunately, this unknown masterpiece is ignored by many tour organizers and the Calabria region isn't doing any better. The historic centre has a typically medieval urban style. It was built over the 12th and 13th centuries. From Lombard beginnings, it became a fortress castle in the Sveva Norman period (1190–1250) and was expanded under the Angioino in the 14th century, and under Aragon (from 1400 to 1500). Homo Sapiens occupied the cave continuously leaving countless relics of bone and stone tools, wonderful graffiti and their skeletal remains. Carbon 14 dating proves occupation since 4470 BC (Neolithic). The Romito man was a Cro-Magnon; he did not keep cattle or practice agriculture or make ceramics. 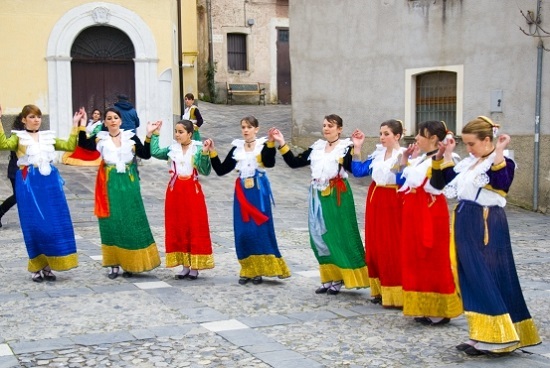 The Arbëreshë are an ethnic and linguistic Albanian minority community living in southern Italy, especially the regions of Apulia, Basilicata, Molise, Calabria and Sicily. They are the descendants of the Albanian refugees who fled Albania between the 15th and 18th centuries as a result of the Ottoman empire's invasion of the Balkans. 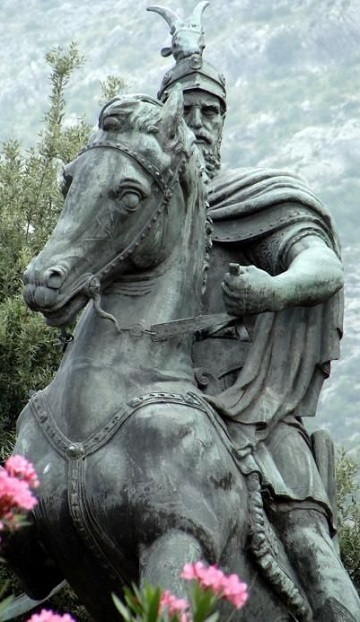 They settled in Southern Italy between the 15th and 18th centuries in several waves of migration, following the death of the Albanian national hero George Kastrioti Skanderbeg and the gradual conquest of Albania and the Byzantine Empire by the Ottoman Turks. Their culture is determined by the main features that are found in language, religion, traditions, customs, art and gastronomy, still jealously preserved, with the awareness of belonging to a specific ethnic group.